My apologies for having neglected my Branching: Thoughts of an Ever Curious Author readership during the past five months. 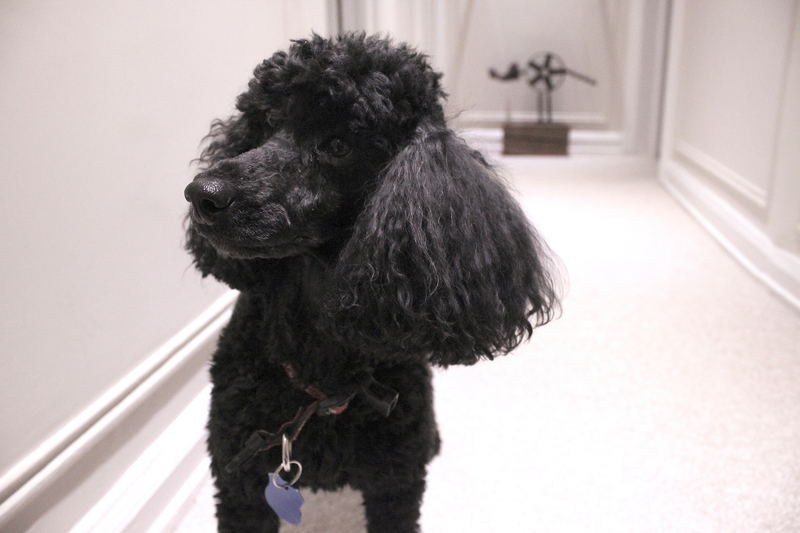 There were many good and bad reasons: reconstruction of my Brooklyn apartment, a new book idea that did not yet gel, a computer crash, and Viva, a four-year-old black miniature poodle that joined our household. I am way past my childbearing years and try to enrich my life with pale approximations of the empowerment provided by a two-year-old greeting Mom’s return. A little animal provides a good approximation. A few lucky accidents resulted in our getting Viva. She was born in a large kennel in Brazil on October 4, 2009. She became a show dog and won numerous prizes in South America and in the US. After she retired, her kind owner looked for a loving “pet—as in foster—home.” Viva joined my husband and me in Maine. Viva is tall, with long, thin legs. Instead of walking, she struts like a miniature parade horse. Her poise is perfect. Her demeanor is regal. When she arrived she did not let us know how bewildered she must have felt, except for being terrified by sudden noises. She did not even recognize her own name: Genevia, which we surely pronounced differently from the way her Portuguese-speaking handlers had. Show dogs are taught to never, ever pee or poop when on a leash. Obviously though, we had to leash her, and after a 24-hour dry spell, in desperation she let go among the splendor of the Maine woods. We called her Viva, we hired a trainer, and within a week she knew her name. She also discovered the advantages of being a pet rather than a working girl. There was no question in her mind that our bed was hers. She went through a delayed puppyhood, chewing off medicine bottle caps, watchbands, and zipper pulls. She loved emptying wastepaper baskets. Most of all she soaked up our growing love, becoming desolate when we left her alone and literally jumping two feet in the air when we returned. She became my virtual shadow, and the best parts of our days were the long walks we took on Acadia National Park’s carriage roads. Four months later we left for New York and poor Viva had to learn to pee on concrete! Fortunately she loves the city: the intoxicating smell of other dogs, the dogs themselves, and their owners. And even though her nose is constantly down exploring what, where, and when other dogs peed, her beauty elicits comments. My husband and I feel immensely cherished by Viva. Her devotion boosted our self-esteem, her pranks make us laugh, and her youth as well as her needs makes us feel young. I even lost five pounds walking her! This entry was posted in Uncategorized and tagged acadia national park, adopting a dog, adopting a poodle, adopting a show dog, blogging, brooklyn, brooklyn heights, dog adoption, dog lovers, dog rescue, dogs, maine, miniature poodles, mount desert island, new dog, new york city, poodles, show dogs, viva. Bookmark the permalink.